With Sunday being my last day of ‘freedom’ as it were, I was in a minor frenzy to get stuff done. 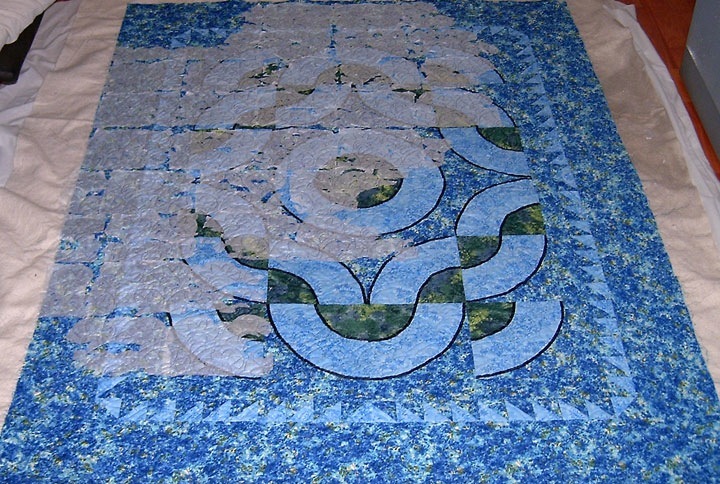 I wanted to finish the quilting on the big fan mystery and also quilt up the kitty convergence too. I was rather all over the map with trying to settle and start on one or the other. heh .. quilter ADD LOL Oh and course I didn’t get as much sleep on Sunday as I wanted .. You’ll find out why at the bottom of my post .. bloody cat n bugs!! 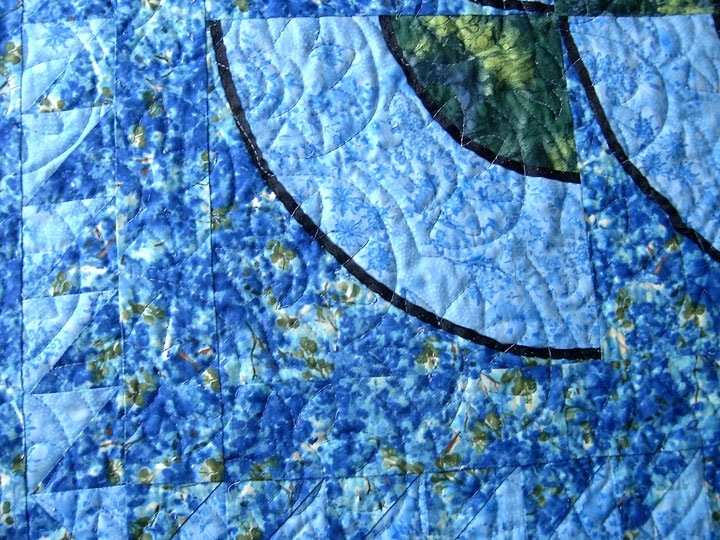 I finished quilting it on Sunday nite and started to do a bit of shredding of the tissue as well. 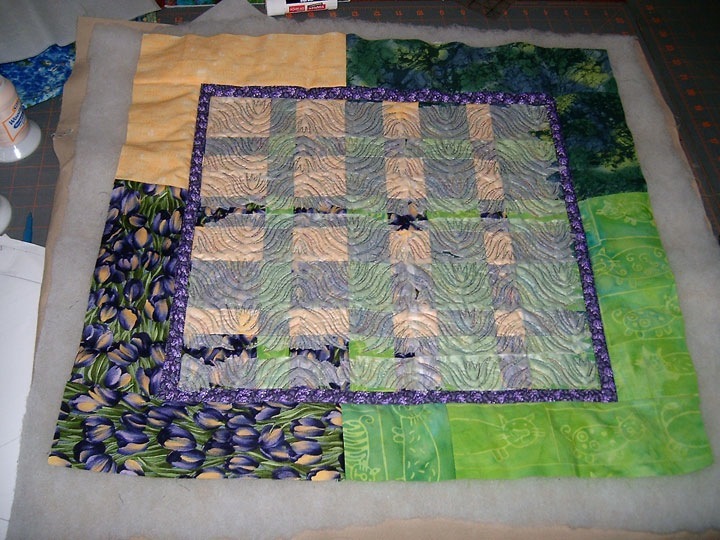 I didn’t get any pictures until today as you couldn’t see the quilting very well with a flash pic. 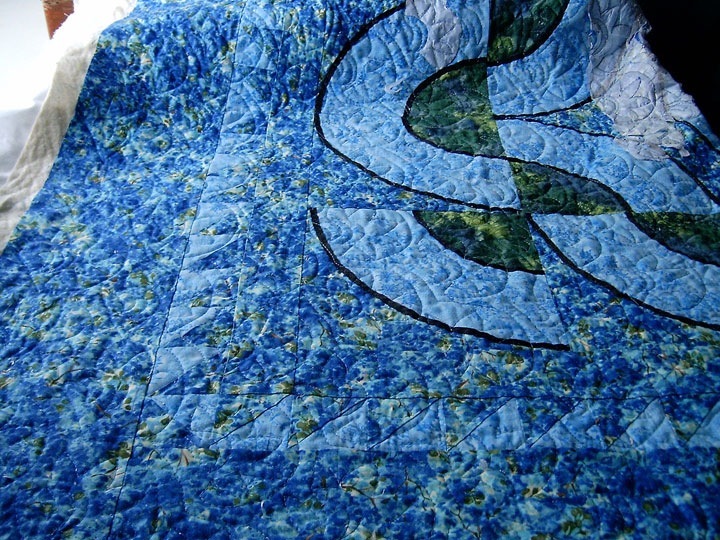 I do love how the quilting looks on this .. sort of creates waves like on the quilt .. I did run out of the variegated blue about 1 row away from being finished but I had a blue that I was originally going to use before I found the blue, so I wasn’t too freaked out .. and this quilt is staying with me .. so it doesn’t have to be perfect – heh .. good thing as there are mistakes in this quilt LOL .. but I know they are there and I learned with this quilt .. so it’s all good. 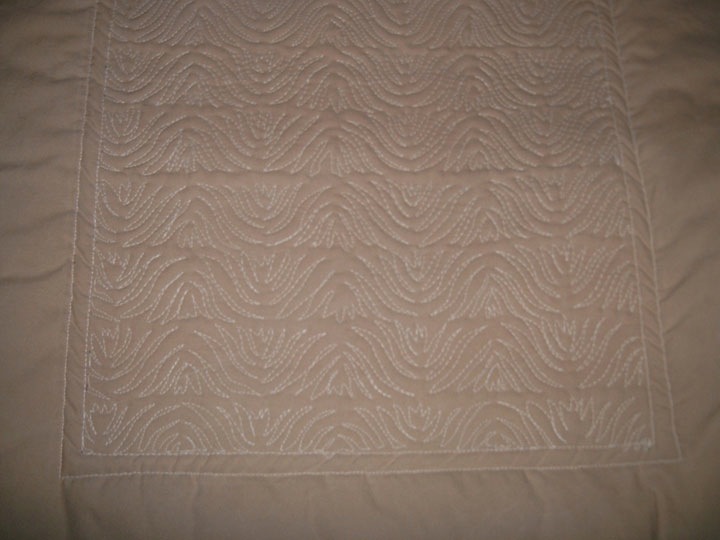 Here’s a nice shot of the quilting in a decent light for pictures. You can see the ‘waves’ really well in this shot. Rather looks like a nice ripple effect .. Just wait until this is washed and crinkles up .. I used cotton on this one and it’s going to look just awesome when it’s done! I just about can’t wait ..
I’ve not made a lot of progress, but considering I only picked at it on Sunday nite and then Monday. I’ve made some good progress! I’d call this about half shredded. You know, it just occurred to me that this are the last two that I had in my WIP pile to quilt – that I had planned to quilt that is., I’ve a few other tops to do, but they’ll get done when they get done .. I picked longer on Sunday than I had planned .. oh geeze I could have killed Shadow .. It was around 2am and I was getting ready to go to bed for my first day of work. Suddenly, Shadow jumps on the couch over my shoulder and I turned my head to see what she was up too .. apparently there was a centipede on the wall over my head – she whacks it one and the bloody thing lands about 1″ from my shoulder .. One nano second I’m on the couch, the next I’m bumping into the TV and the remotes are flying and hitting the floor, tweezers go flying, tissue paper (I put it in a grocery sack as I pick it off) is flying thru the air making it look like a ticker tape parade .. and there’s this centipede right where I just WAS!!!! Egads .. well shadow got scared with all the flying objects and mum .. took off .. so here I am left to deal with a centipede that is the length of my hand!! Have you figured it out that I’m terrified of them yet?? Pix is no where to be found either .. so here I am ALONE … with a centipede. jiminybloodycricket!!! I get the ‘brilliant’ idea to use my tims cup (the paper ones with the lid) and close the lid over the critter and just put in the garbage .. took me a bit to get my nerve up, heart rate down (not sure it did go down) and take the step .. well I get it in the cup .. I’m almost breathing again, when I feel it on my hand .. OMG!!!!!!!! cup goes flying, it lands ON MY QUILT and scurries into the folds .. ohmanohmanohmanohman. Twit for brains here, didn’t have the opening in the lid closed all the way so of course it escaped! Finally 10 minutes later I stop shaking and get my nerve up again to lift the folds of the quilt bit by bit .. couldn’t see it .. freak city happening over here! Finally I pick it up and give it a shake .. bloody thing ran under the couch .. (@@) (those are rolling eyes) I give up!!! My hearts going beyond Mach 1, I’m just about having an asthma attack from the stress of it .. oh and there’s no way I’m ready for bed now .. I clean up the mess, find my tweezers and keeping an eye on the floor, shred for another 2 hours .. I was going to comment on your quilts but I am laughing out loud at your story! I hope you made it through your first day of work OK! You poor thing. I can’t help but chuckle though. It is amazing what scares people. For me it is spiders.